Present estimates of Nova Class Guyver type abilities have been compiled and summarized below. 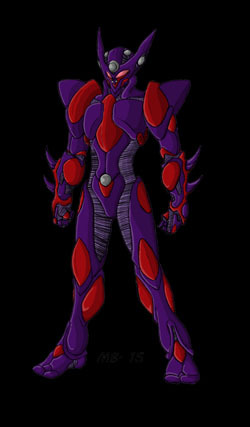 -Physical strength seems to vary but ranges from two to three times that of a normal Guyver. -Durability: Subject possesses superior bio-armor like the Warrior Unit but has only four times the normal regeneration rate of a normal Guyver and no standard body shield like the Warrior Unit, but subject can project a powerful energy shield of fusion energy that can block anything up to a standard Mega Smasher class weapon and incinerate any unshielded object it contacts. The subject can maintain this shield for several minutes at a time but use of shield accelerates use of energy reserves and shortens subjects stamina. -Speed: Subject has a normal speed of 0-450 MPH ground speed and 0-700 MPH flying speed, but can enhance speed by channeling fusion power for a speed boost that lets them reach a top running speed of 1000 MPH and a top flying speed of 3000 MPH. Stamina seems to be roughly ten times greater than a normal Guyver but recovery time seems to be about the same. -Vibrational swords are similar to standard Guyvers but possesses higher tolerance values that lets them break through ordinary vibrational swords and can be further enhance with fusion energy, giving swords a fiery plasma field that doubles their effectiveness. Only the Warrior class Vibrational sword can withstand an attack from a Nova Guyvers sword at full power. -Head beam laser orb is enhanced by subjects fusion energies and emits combo plasma/infrared laser beam equal in power to the Warrior Guyvers head beam and approximates ten times the power of a normal Guyvers head beam. -Pressure Cannon is augmented with an explosive fiery plasma energy charge that makes Cannon act as a armor piercing plasma energy bomb with three times as much destructive power as a standard Guyvers pressure cannon and can be fired rapidly for short periods of time but like the energy shields, this drains subjects energy reserves and shortens his stamina. Subject can also fire single handed combo pressure cannon/plasma fire ball blasts. -Shoulder pulsors: subject has two plasma bolt pulse emitters, one on each forward end of his shoulder bands that can rapidly fire concentrated pulses of plasma fusion energy and approximates the destructive power of a Zoalords gravity bullet attack. -Mega Smashers: The subjects Mega Smashers are similar to twice that of a standard Guyvers power level but can only be fired five to six times before subject is too drained to continue fighting. -Sonic emitters are similar to standard Guyvers at twice the power level. -Subject is able to perform a combined attack with his sisters Unit that produces an effect akin to small nuclear explosion, destroying any unshielded object around the twins for up to one mile. The twins can also channel this power into a directed attack, which varies in power from 1/2 to 4 times the power of a Guyver Mega Smash. Reports also indicate subject can create a fusion blast field at will in a similar manner as the Warrior Guyvers blast field but has a greater destructive range due to explosive nature of the Nova Guyvers blast field which resembles the corona discharge of a collapsing star and is propably why this Guyver Unit class was given the name Nova..